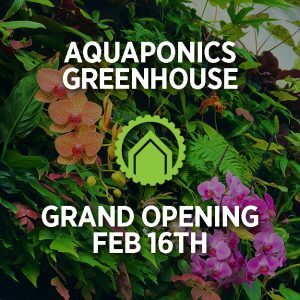 Join the Science Mill for the grand opening of its new Aquaponics Greenhouse and the celebration of its fourth birthday! Explore the new 1,000-foot greenhouse, a working aquaponics system where visitors can see how fish, plants and microbes work together to create healthy food, and participate in presentations, activities and games that highlight the intersection of technology and biology. Visitors can also explore all of the Science Mill’s mesmerizing exhibits, see a 3D movie and win prizes. All grand opening activities, demos, speakers and games are included with Science Mill admission.